The Wood duck (Aix sponsa Linnaeus, 1758), also called Carolina duck in Europe, American wood duck, Woodie, Acorn duck, Summer duck and North American wood duck, belongs to the order of the Anseriforms (Anseriformes), to the family of the Anatids (Anatidae); it’s one of the two species belonging to the genus Aix. The name of the genus Aix Aix is a Greek name mentioned by Aristotle, and refers to a bird, and means “small goose, grebe, duck” even if this is still an undefined term. The term indicating the species sponsa comes from the Latin and means “betrothed, bride”. It is therefore, an “aquatic bird in bridal dress”. 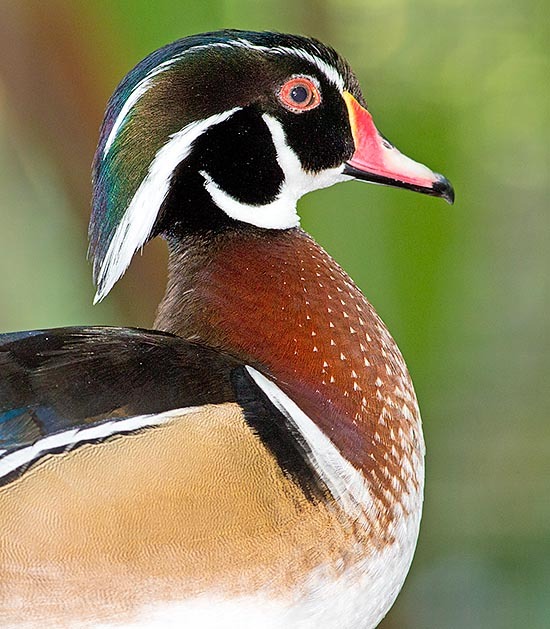 The wood duck is native to a vast central belt, not continuous, of North America and more precisely: of eastern North America, of western USA coast, of Florida and of western Mexico reaching Cuba, hibernating in southern California and in the Pacific Mexican coast. This duck resides the whole year in the southernmost parts of its range, whilst the northernmost populations migrate southwards in winter. Some specimens have been observed in Europe, but they ware specimens escaped from captivity or freed. The habitat of this species is formed by ponds, small lakes, pools, swamps, small secluded areas of water and slow-flowing rivers. They frequent also faster flowing rivers if the pass through dense forests of broad-leaved trees. This species, with its nesting specialized in hollows, depends from woody habitats provided of water and where are present ripe trees having sufficient cavities of suitable size for the nesting. It is a fairly compact, 47-55 cm long, duck having an average weight of 550-870 g and a wingspan of 66-73 cm. Also the male of this species, like the Asian conspecific Mandarin duck (Aix galericulata), exhibits a nuptial livery with splendid colours rendering them the most coloured American aquatic birds. As often happens, in spite to the showy colouration, these ducks are however mimetic in their own aquatic ambient in the shade of the protruding vegetation. 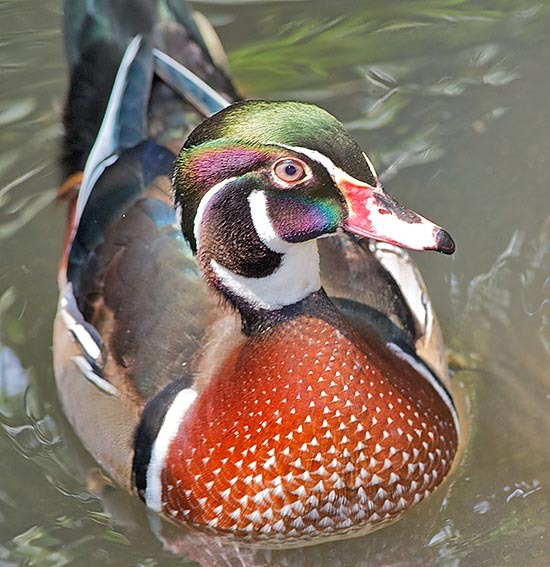 Also the male of the wood duck, as the Asian cousin, has an abundant tuft of erectile feathers, missing are, however, the elongated lateral feathers of the cheeks typical of the male mandarin duck. The head is metallic dark green with changing upper parts, a dorsal-posterior lateral part of the eye is bronze-changing violet, of the same colour is the terminal part of the tuft; the cheeks are velvety black with greenish reflections. The whole head is interested by white lines with a typical drawing: white is the chinstrap and two verticalized stripes going from the same towards the dorsal part at the level of the cheek and interrupting by about mid-head; white is also a superciliary stripe starting from each basal part, lateral-dorsal of the bill, goes along the whole head, and converge, at the level of the tuft, in another white line starting a little back of the eye. The chest is red-brown, regularly dotted of white; the continuation of the chest and abdomen is white. The sides of the body are brown-leather-cinnamon, finely white frosted. Always laterally, between chest and sides stands a white stripe followed by a black one, both vertical. The back and the tail are brown-dark blackish. Before the tail, laterally, after the brown cinnamon vermiculated of clear, stand some curved vertical white and black lines and then a portion of colour similar to the one of the chest. Dorsally, the wing is dark brown with ample blue iridescent speculum bordered, at distal level, of white. The under-wing is pale grey shaded of black behind and spotted dark in front. The bill is very coloured, red with a small yellow edge at level of the dorsal junction; the lower rhamphotheca and the dorsal part of the upper one, nail included, are black; the lateral part under the nostril is of flesh-whitish colour. In the adult males the eye is bright red, with palpebral rime red too. The paws are yellow shaded of greyish. The females, with their more modest liveries, closely resemble the females of mandarin duck but, compared to these ones, have the white zone surrounding and embedding the eye much bigger; also the bill of the females of wood duck is bigger with dark grey colouration and black nail instead of whitish. The back of the wood duck females, compared to the mandarin’s females, is darker and of green-glossy brown colour; finally, the females of wood duck appear bigger and longer with less pointed front and shorter paws (with colouration similar to that of the males), equipped with important nails with which they cling easily to trunks and branches. In the females the eyes have dark brown iris. Despite their short paws, the wood duck are capable to walk rather quickly on the ground. Their fluttering is fast, the movement of the wings generates hushed whistles and the flight is rapid and agile among the trees, helped, in their manoeuvres, by the tail, wide and squared. These ducks are able to swoop down, nose-diving in an almost vertical way, in small ponds and small wood lakes “landing” with loud splashes. Proportionally, the eyes are fairly big in order to see in the dim light of the sites where they do live. The young have colouration similar to the females. The young males distinguish precociously from the young females thanks to the bigger extent of the white at the level of the chinstrap. This species is more active early in the morning and the evening. 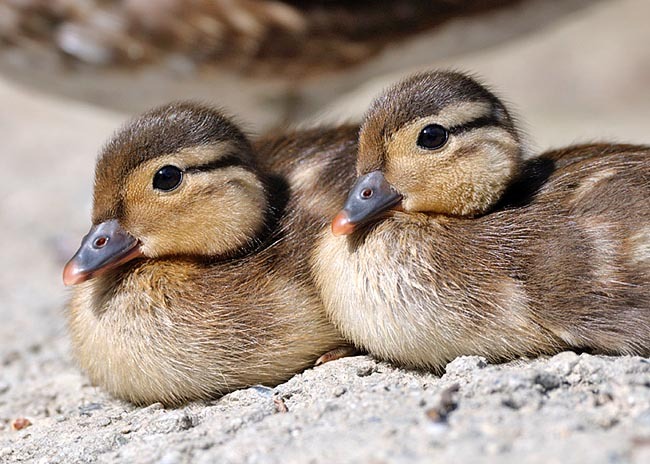 Their feeding is omnivorous, they nourish of a wide variety of plants; the predation of insects, tadpoles, amphibians, small fishes and small animals is particularly important for the females and their growing ducklings. In autumn and in winter they nourish mainly of acorns, chestnuts, beechnuts and nuts. The pairs begin to form in autumn/winter; the pair bond is rather strong (it is easy to see the partners exchanging mutual effusions and scrapings with the bill) and can at times extend beyond the breeding season. The males of wood duck, during the courting, raise the long tuft which, in this way, assumes the double volume than when resting and in the meantime rotate the heads from one side to the other exhibiting and showing the splendid and variegated bright colours. The competition for the conquest of the females may aver intense. This species is one of the first American duck is to get the nuptial livery in autumn as well as it’s one of the first to get the eclipse livery. In spring, the males of wood duck keep in continuous vocal touch with their conspecifics emitting very low and almost imperceptible sounds. Conversely, when alarmed, the females emit some screeches in crescendo or strong “cr-r-ek-cr-r-ek”. These strong vocalizations, emitted by the females, are advantageous in habitats with reduced visibility due to the abundant vegetation where they live with the hatchings. These ducks fly with the head held high and the bill slightly tilted down. 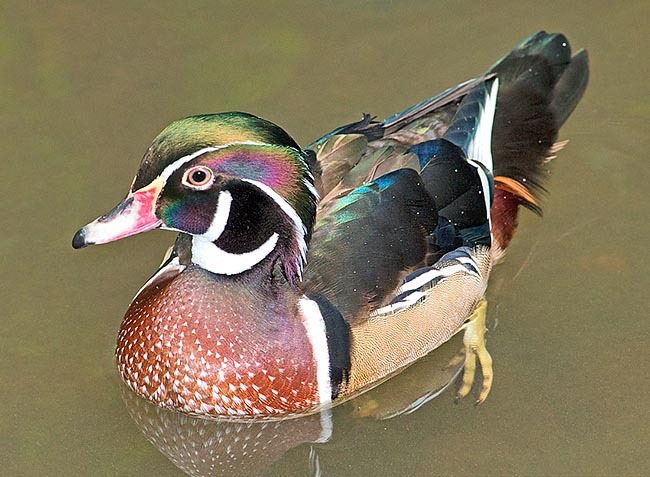 Of suspicious nature, the wood duck can become confident when not disturbed, especially in the calm and sheltered water ways present in the urban parks. In the wild locations, due to the encroachment and the forest isolation where they live, they do not tend to socialize with other aquatic species. During the day, it tends to rest on branches or structures emerging from the water. During most of the year, the wood ducks not in reproduction, form great groups of individuals gathering in ample common sites characterized by shallow waters and by vegetal covers even if rather scarce; in these sites some common perches may be occupied even by some thousands of individuals. In these locations the ducks by the sunset fly in small flocks from the feeding places to the night perches where to spend the night. By the first hours of the dawn, they perform the reverse flight. In North America, the wood ducks are migratory as well as sedentary. The migrant couples arrive by early spring in the northernmost places where they reproduce; in March or April after that the ice has melted n the ponds and the swamps they frequent. The couples reproducing south of the range, in the same spring months can already have their progeny spawning by early February. The females of wood duck nidify also in the nests of the Pileated woodpecker (Dryocopus pileatus) (and, in the past, in the nests of the Ivory-billed woodpecker Campephilus principalis). Both members of the pair dig and adapt the nest to their own exigencies even if it is the female who chooses the suitable cavity where to spawn. The nests can be placed up to 20-25 m of height and it is not unusual to see these ducks even vertically hung clinging with the nails and leant with the tail, like woodpeckers, close to the holes. Any cavity in the trunks and in the branches of the most different trees is much sought for the realization of the nest. The nests with small entry holes are preferred, this to hinder the entrance of the raccoons (Procyon lotor). Other terrible eaters of eggs, and that cannot even be stopped by the small holes, are the snakes. The wood ducks when looking for nesting sites, have often the habit to enter also the chimneys of the houses where they may get trapped; in the regions where this phenomenon is developed it is good practice to check the chimneys in order to avoid unnecessary deaths. For the nesting sites, the species competes with the common starling (Sturnus vulgaris) and with the woodpeckers spp. which may get to feed of part of the content of the ducks’ eggs. The nests can be located even at remarkable distance from the water (even more than one kilometre), by sure this forms an extra risk for the ducklings who are obliged to a long walk for reaching the water; in such cases entire hatchings are easily lost. The species is not strongly territorial and the nests, if the sites are not suitable, can be realized also close to each other. The eggs are laid in nests well padded of material and of down which the female tears off from the abdomen. The fairly big eggs are roundish (acute side little acute), slightly variable size and translucent cream-beige colouration. The eggs are quite similar to those of the congener mandarin duck (though maybe the mandarin’s ones are as an average even slightly bigger). The brood is formed by 7-15 eggs but it s not unusual to find, in the same nest, more eggs fruit of intraspecific parasitism; if the nest contains too many eggs, the hatching is compromised and the nest is often abandoned. The incubation lasts about 30-33 days and if the brood is destroyed, the female spawns again but n a different cavity. The newborns, much similar to those of the mandarin duck but darker, get off from the nest incited by the vocalizations of the mothers gotten out from the nest. The females are to deal with the chicks during the two months necessary for the reaching of the independence though the males keep with their females during most of the breeding (more than other North American species); until the beginning of the hatching of the eggs, or more, at times. 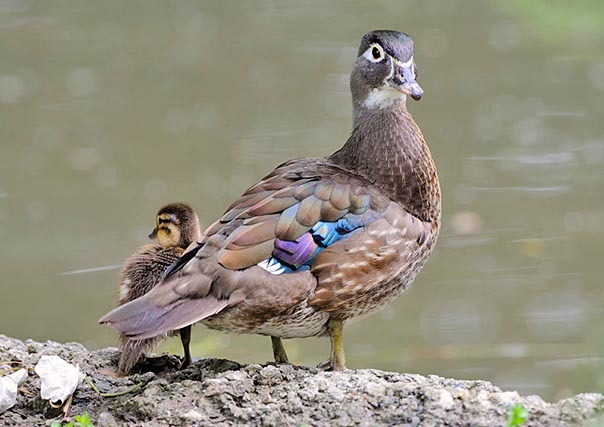 The wood duck is the only North American aquatic bird capable to perform, in the southernmost range, more than one hatching per year and in such cases the females can abandon the young when one month old for dedicating to a following brood. The raccoons are the greatest menace for the eggs, the duckling and also for the hatching females. Other predators of ducklings are the alligators, the snakes, the rats, the marsh turtles and the Bullfrogs (Lithobates catesbeianus). The ducklings are very lively and fast, they are able to immerse easily looking for food or for escaping the predators. The main predators of the adult ducks are: the Tiger owl (Bubo virginianus), the American mink (Neovison vison), the Raccoon (Procyon lotor), the Red fox (Vulpes vulpes), the Grey fox (Urocyon cinereoargenteus), the Alligator (Alligator mississippiensis) and the Black rat snake (Pantherophis obsoletus). 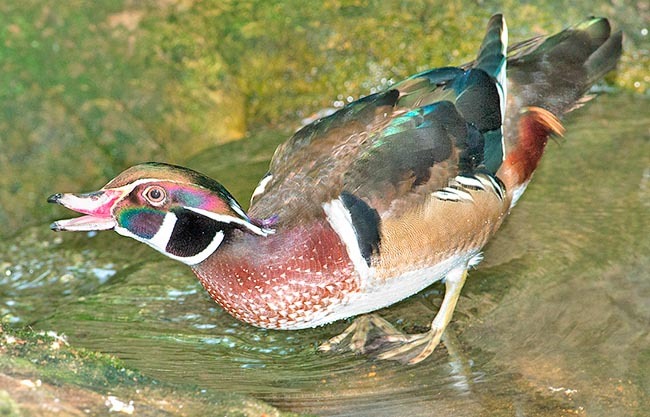 Even though the wood duck is one of the nesting aquatic birds most numerous in the eastern USA, during the first years of the last centuries it was, conversely, quite rare. The great forests of broad leaved trees have been systematically cut thus subtracting the ripe trees of old but rich of cavities suitable for the nidification of this species. This, combined with the drainage of the wet zones, the advent of semi-automatic hunting rifles, the hunting intensely carried out in various seasons and the request of the feathers of the species for the manufacturing of the artificial flies for fishing the trout, have been the main causes of the past rarefaction of the species. The wood duck, as wild animal, has been even considered as virtually extinct in 1918 but luckily some healthy populations had remained far from the paths of the hunters. A later program of construction and distribution of nestboxes has led to an immediate and almost miraculous increase of the species which has come to count 3,5 million of individuals in 1960. Nowadays, the species due to the loss of habitats, the increase of the human population and to the restart, even if limited, of the hunting (which had been totally prohibited between 1918 and 1940) has registered a decrease: about 1,4 million of specimens during the nineties. This duck is much appreciated by the ornamental breeders of the whole world where it is one of the most bred species also with various mutations of colour obtained in captivity; the ancestral form, as usual, remains the most beautiful. The life expectancy of the wood duck is of about 15 years.